If you've ever shopped for ski equipment, chances are you experienced a bit of sticker shock. Not only are skis and snowboards spendy on their own, you then have to purchase accessories like boots, bindings, poles, helmets, goggles and snowgear. Sometimes purchasing new ski equipment is a reasonable investment, but if you're looking for a way to cut corners, you may want to consider buying used ski equipment. 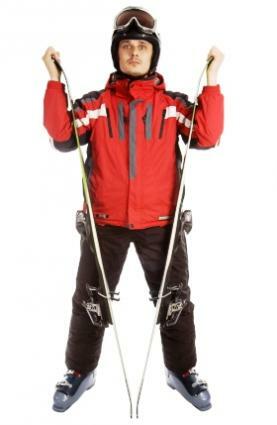 Who Should Buy Used Ski Equipment? Are you willing to lay out $400 or $500 on a quality pair of skis that you'll only use once or twice a season? That comes out to roughly $50 per trip over the course of four years! You'd be better off renting gear if you're willing to shell out that kind of cash. Buying skis for kids is like buying pants for kids - you have to keep on buying them as they grow. Even if you're a ski-weekly family, it doesn't make a lot of sense to spend hundreds of dollars on new ski equipment that you're going to have to retire after a single season. Even if you head to the slopes regularly, if you find yourself spending most of your day hanging out by the fire, only taking an occasional downhill run, you're probably the type of hobbyist who can get away with buying used ski equipment. When purchasing used equipment, make sure you do your research. Check out sites like Ski Review and OnTheSnow to see what third-party reviewers have to say about the equipment you're considering purchasing. While you can easily purchase a set of used skis or a snowboard online from websites like eBay and Craigslist, try to at least find the same item in a store so you can see and feel the item before making your online purchase - you wouldn't want to buy a pair of skis that are too short or too flimsy for your liking. If you live close to a ski resort, call to ask whether they offer demo equipment or slightly used rentals for sale. Generally, these items are good quality, and will be well-tuned, without major scuffs or damage. Some ski resorts have demo days, when ski and snowboard vendors allow you to check out their goods and purchase their demo equipment at a nice discount. When you walk away from your sale with a great pair of skis and more money in your pocket than you thought possible, you'll be glad you decided to purchase used ski equipment.